There's something so deeply unsettling about how masterfully crafted the slow burn doppelgänger terror in Us is. Thanks to the runaway success of the acclaimed Get Out, comedian turned horror filmmaker Jordan Peele's seemingly natural storytelling prowess feels even more confident as his precise use of doubles as a motif strikes every frame of his sophomore effort superbly. The mysterious supernatural premise revolves around an African-American family's summer trip to Santa Cruz where suddenly a group of their exact doubles starts haunting their vacation home. This incident is tied mysteriously to a traumatic event from the past as the film's prologue starts off squarely in 1986 using some classic (if forgotten) hallmarks to remind us of prior fears. It's truly impressive how Peele uses horror imagery and iconography to unfold his story visually. The stunning Lupita Nyong'o, in shockingly her first starring role, is an absolute force of nature in dual parts as a mother and her twin stalker, Adelaide and Red. Her scream queen role is a towering performance that ranges intensely from scene to scene yet sustains the trauma throughout. She channels a true sense of terror as the home invasion violence eerily begins and her physicality anchors the tightly-paced film's many scares. 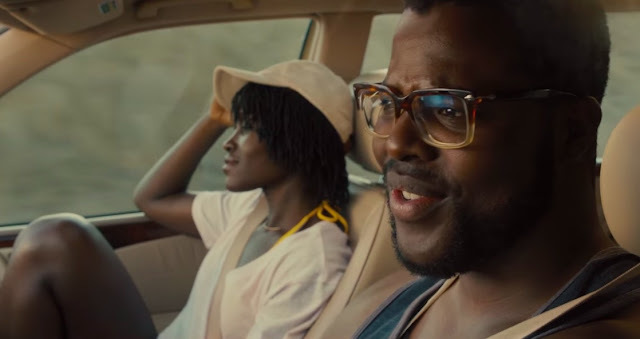 A bespeckled Winston Duke, who channels his peak dad joke powers, proves rather hilarious and quite earnest as the comic relief early in the film and intermittently throughout the ongoing chaos. However, it's the kids, Evan Alex and Shahadi Wright Joseph, who steal the show as both brother and sister and their haunting mirror selves. It's eerily terrifying seeing an all-American family face off against their evil selves so dramatically. The family's affluent (also very white and drunk) friends, played amazingly by Elisabeth Moss and Tim Heidecker, are also aces in small but rather affecting roles. These characters reinforce a clear sense of class to the film's underlying, multi-layered themes as Us provides a very different kind of horror with Peele using different tricks to cement his stark visuals. You get the impression they're starring in their own comically irreverent film all to themselves. Peele deftly expresses the forgotten cost of comfort and apathy of privilege. Us certainly proves Get Out was definitely no fluke. Peele's expertly honed skills as a patient yet dynamic auteur are imminently even more obvious. While not as clever or satisfying, this film is such an expressive slow burn thriller of multiple horrors. It doubles as both drama and trauma frighteningly well.